Lowdown: The Frankenstein monster finds itself in the thick of battle between angels and demons over the fate of humanity. I, Frankenstein has some very obvious B movie indicators. These start with its general absence from cinemas and progress through its immediate availability at Netflix. However, contrasting those indicators are some very big names in the starring list: there’s Aaron Eckhart as the lead, Bill Nighy as the chief baddie (a role always best reserved for Brits, of course), and last but not least this blog’s favourite Miranda Lawson, aka Yvonne Strahovski. The latter was the one and pretty much only reason I took any interest in the movie. Story wise, this is no Frankenstein remake. Instead, after Frankenstein (the monster's creator) died, his artificially made monster (Eckhart) finds itself sought after by a bunch of demons from hell (yep, hell). Lucky for him (it? ), he is saved by the demons’ nemesis – the gargoyles (a rather peculiar manifestation for the role typically reserved to angels, but let’s go with the flow). The gargoyles bring the monster, whom they name Adam, back to their “home base”, where it’s protected by the gargoyle queen (Miranda Otto), her chief warrior Gideon (Jai Courtney) and a slew of other Australian actors (because this movie was shot in Melbourne). Our Adam proves more than meets the eye not just in super strength but also in longevity. He makes it to modern times without missing a beat. And it is at these times that the bulk of I, Frankenstein takes place. You see, the devils have a plot to take over the gargoyles and the world with, a plan that involves creating artificial Adam like monstrosities. Unknowingly aiding them in their quest is scientist Terra (Strahovski). Whether the devil can take over the world or not will come to depend, eventually, on Adam/Frankenstein. If I did not manage to convey just how silly the plot is, then you will need to take my word for it: it is silly. Padding it are tons of pseudo-scientific statements that make no sense but allow the lab coat clad Terra to look oh-so-professional in addition to just looking good (the way girls in movie are supposed to look by your typical Hollywood agendas). Characters are very single dimensional, with Eckhart starring in this department but Nighy proving the exception; in between lies Strahovski who, for the first time I can recall, offers a disappointing performance. To her credit, hers was an impossibly pathetic position to be in the first place. Thus what smelled like a B movie turned out to be a proper B movie, with everything that comes with that. There’s plenty of silly action that’s as involving as reading last year’s winning lottery numbers and… not much else. What a waste of resources and energy. Best scenes: As usual for movies shot in Melbourne, the best scenes are those involving the city itself (even though the movie’s city remains nameless and is obviously not meant to be Melbourne). There’s a scene where Eckhart is on an old Hitachi train (I wonder if it stunk for him the way it stinks to us), Stahovski alighting off a tram, and a major action scene at the gates of the National Gallery of Victoria museum posing as the movie city’s central train station. Woot. 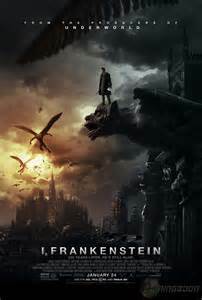 Overall: Do not contribute any further to this waste; steer away from I, Frankenstein. 1.5 out of 5 useless crabs.